I knew I MUST bring my family to Vancouver. 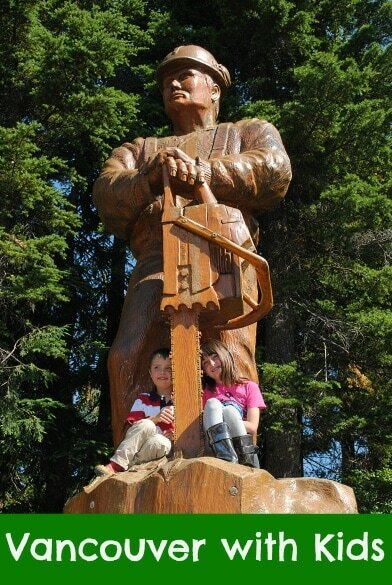 I got hooked on this Canadian city’s friendly attitude, love of the outdoors and tasty cuisine during a visit a couple of years ago for a travel blogger’s conference and I vowed to return with my brood. There’s just so much to see and explore for all ages in this coastal town. Here are some fun attractions and activities to ensure you have an incredible time in Vancouver with kids. No trip to Vancouver is complete without a visit to Stanley Park. It’s the Central Park of Vancouver, if you will. This nearly 1,000-acre urban park offers everything from hiking paths, bicycle rentals, picnic areas and playgrounds to restaurants, beaches and a free water park with plenty of splash fountains. There is no way you can tackle all there is to do at Stanley Park in one day so take a look at a map and select one or two things instead. 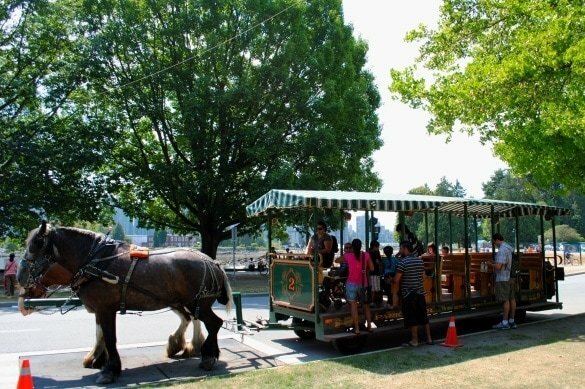 My family opted for a Stanley Park Horse-Drawn Tour aboard a trolley-like carriage, with educational narration and a stop to peek at the park’s famed Totem Poles. Our guide started our tour with the foretelling announcement, “And we’re off like a heard of turtles.” It was a pleasant tour of the park’s Rose Garden, Lions Gate Bridge and other notable spots, but it might be a better bet for travelers with older kids who are better at sitting still than my two wiggly youngsters were. Hungry? Head to Granville Island! 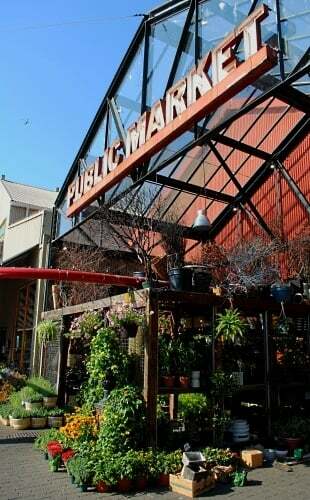 You could spend all day here sampling the wonders from vendors’ booths in the Public Market. 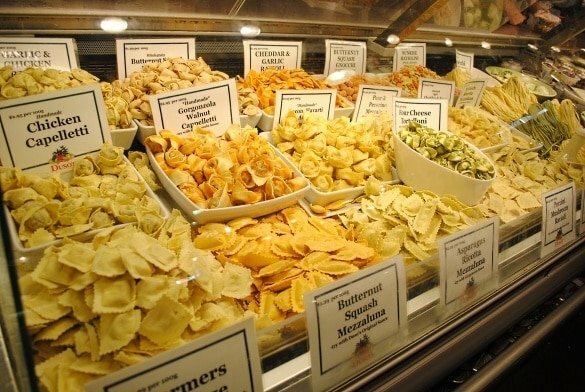 A cornucopia of colors and scents tempts foodies. Choose from shiny black cherries, orbs of soft mozzerella cheese, giant bagels of all varieties, and fresh raviolis stuffed with ingredients like walnuts and gorgonzola. If you’re looking for a sit-down meal, visit Dockside Restaurant on the island. The outdoor patio views of the harbor cannot be beat. When the weather is nice grab a glass of vino and toast your good travel fortune for bringing you to Vancouver. Of course you will need to stop into the Kids Market, a two-story wonderland stuffed with all sorts of toy stores and an indoor playground. Each shop is individually owned so be sure to pay for any goodies before moving on to the next venue. Wander outdoors to take a gander at the ducks and geese along the shore. 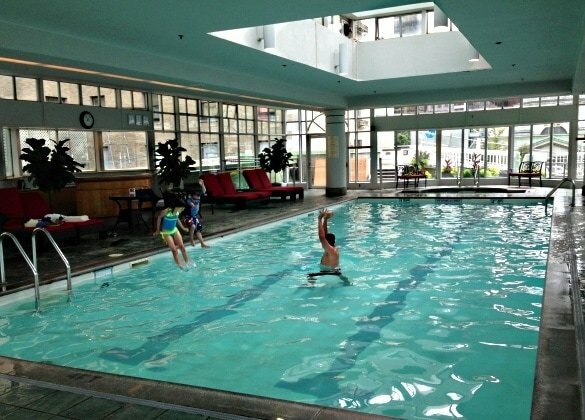 A 15-minute drive from downtown, you’ll find Grouse Mountain Resorts. In winter months families flock to Grouse Mountain for skiing, ice skating and snowshoeing adventures. 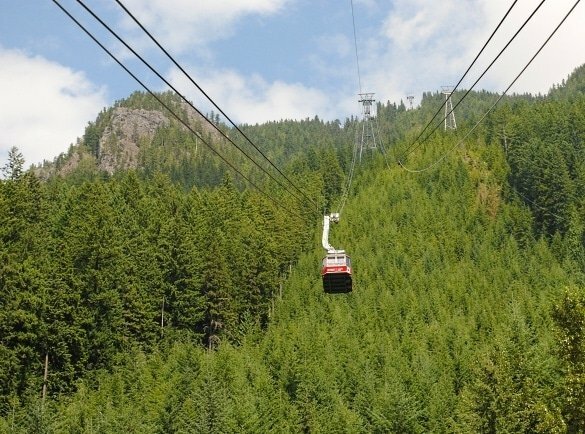 During more temperate seasons travelers board the Super Skyride to be whisked high above the city for zip-lining, animal demonstrations and lumberjack shows. During the Birds in Motion demonstration vacationers get a chance to see the world’s fastest animal zip through the air; the peregrine falcon can soar at speeds of up to 200 miles per hour! 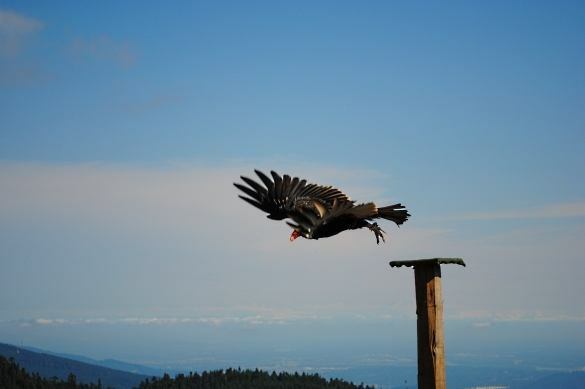 Other raptors like hawks, eagles and vultures also display their flying skills. 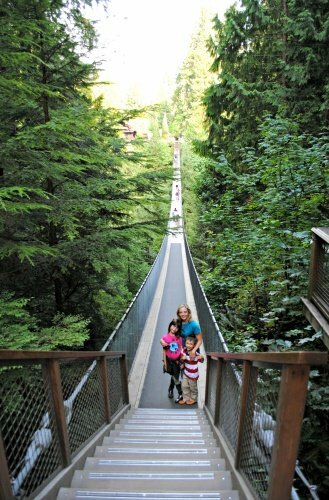 If you have a fear of heights and wobbling bridges, you might want to steer clear of the Capilano Suspension Bridge. For everyone else…mosey on across! Much more than just one bridge, there are plenty of trails to explore and bridges to cross among tall piney trees. You will also find live musical entertainment, a gift shop, and a restaurant and snack bar here. For a soulful taste of the culture of Canada’s native peoples, (carefully) climb aboard a 12-person canoe for a tour through the waters of Indian Arm. 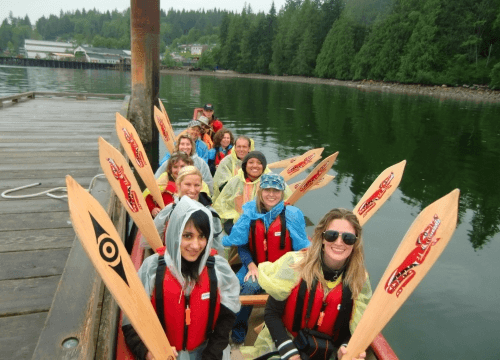 I embarked on my canoe tour with a bunch of adult travel bloggers during my previous visit to Vancouver, but Takaya Tours welcomes children as well. Through stories and songs that give praise and thanks to nature, our Takaya Tours guide taught us about the First Nation’s connection to the area’s animals and environment. 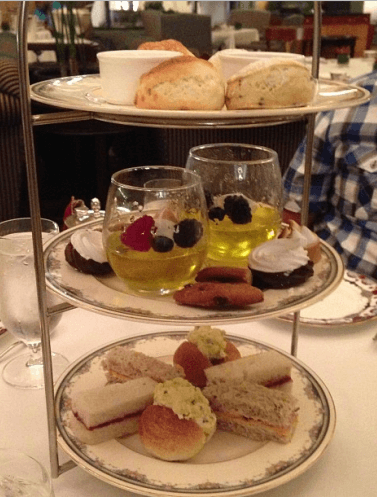 There’s nothing that delights this Travel Mama more than a lovely afternoon tea, especially a child-friendly tea like the one at the Fairmont Hotel Vancouver. This hotel’s Bubblegum Tea does not actually come with chewing gum but it does feature kid favorites like PB&J finger sandwiches, Jell-O parfaits and sweet treats. Not to worry, Mom will be pleased with more grown-up sandwich selections, herbal and leaf teas, and, of course, scones with lemon curd, jam and clotted cream. My family has a slight obsession with blue whales. They are so dang big! The largest animal to have ever lived on Earth, much larger than the largest dinosaur, these behemoths can be hard to imagine. 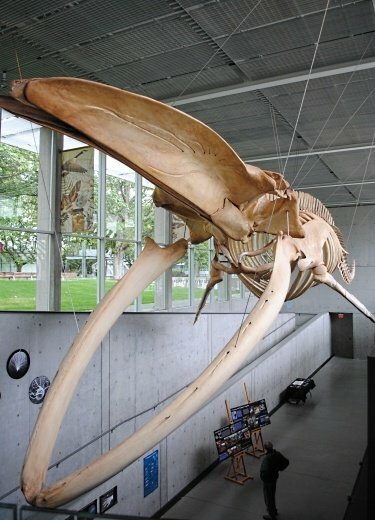 When we learned that there was an entire blue whale skeleton reconstructed and on display in Vancouver, my 8-year-old daughter insisted we visit the Beaty Biodiversity Museum. Keep in mind this structure is on display in the middle of the campus at the University of British Columbia, which means you must park and walk a good bit before reaching the museum. The whale bones are visible at the entrance and I must admit that once we saw what we came to see, we did not bother with paying the entrance fee to peruse the rest of the museum’s offerings. Beaty boasts over 20,000 square feet of displays of fossils and animal specimens, most of which I believe would be of little interest to young ones. Still, the whale skeleton made a lasting impression, one that comes up in bedtime discussions from time to time. My family was lucky enough to spend three nights at the Fairmont Hotel Vancouver. This luxury hotel has a rawther fancy, old world feel. The 900 West Lounge has such a swanky appeal for cocktail-seeking adults, which was difficult to resist after a day filled with kid activities. In fact, my husband and I took turns ducking down for a drink or two after the kiddos were tucked in. The best part of our stay? 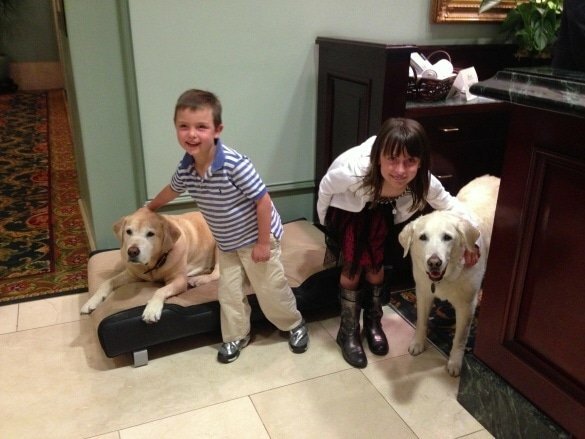 Fairmont Hotel Vancouver’s pet ambassadors, by far! Nothing makes a family feel more at home than a couple of sweet dogs lazing about in the lobby, happy to get and give love galore. Want to visit Vancouver with kids? Visit Tourism Vancouver’s website and start planning your trip today! What’s your favorite Vancouver with kids attraction? Let us know in the comments below! A Note from The Travel Mama: My family’s Vancouver vacation was partially hosted by Tourism Vancouver and the Fairmont Hotel Vancouver. All opinions are my own, as always. Are you kidding? Pet ambassadors. That is fantastic. Charles – So cool, right?! The dogs were so sweet and tolerant of so many petting hands, too! Thanks for sharing the beautiful places in Vancouver! They are so lovely! You’re a wonderful mom because you can easily travel with your kids. Some thought it would be hard to travel with kids but it was easy for you. Thank you for the comment, John! While I love traveling with my kids, it’s certainly not always easy. But it IS always worth it! Thanks for the great homage to Vancouver, one of my favorite cities in the world! Part of what makes it so great is the fact that it has something for everyone, and is especially great for families and kids! Play on the beach, walk through Stanley park, feed geese in the lagoon – all without spending a dime! Rashad – Vancouver is one of my favorite cities too, especially for families! Thank you for the comment!